Happy Hour in August – what a wonderful time. Hot dogs, sodas, beer, and blue skies – what else could anyone ask for? Perhaps some great conversation with Friends of the Soldiers Home and the residents? We had that too. Everyone had a great evening Aug. 26 – with smiles on their faces, remarks about great hot dogs – and several new Friends who joined us for the first time and were delighted with the experience. Come and join us – we’d love to see you. To get on the Friends volunteer e-mail list, write volunteerfriendsofsoldiers(at)gmail(dot)com. Back in December 2011, some neighbors who live near the Armed Forces Retirement Home-DC got together to volunteer for the first time at something called Big Bucks Bingo. We didn’t realize it, but a tradition was born. 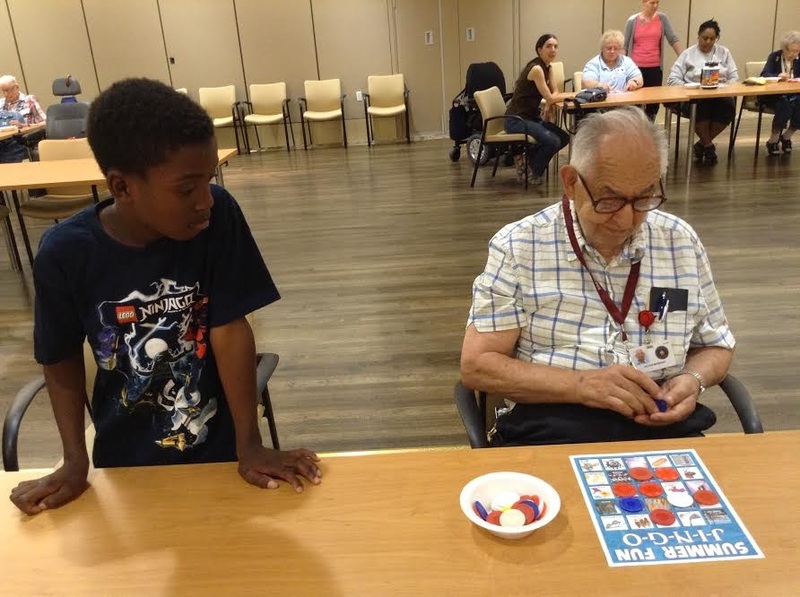 Thursday, Aug. 14, marked the 30th time Friends of the Soldiers Home provided volunteers for our monthly game night, now Jingo instead of Bingo. While Friends does many different things, Jingo remains our flagship event. And we haven’t had to cancel yet because of a lack of volunteers, thanks to the wonderful people who come forward. Some of our august, albeit more physically challenged veteran friends need help hearing the clues, seeing their game boards or understanding when they’ve won, so the more volunteers who come, the more veterans are able to play. Thursday may have been our best night yet, as 15 volunteers came forward! Volunteer John Salatti made the evening special by sharing some of his special birthday cake. The night was also fun because it included seven children! This month we feature photos of some of the kids, and residents — Mr. Burroughs and April, Mr. Dozier and De’von, and Mr. Mosesso and Mercer. Photos courtesy of Lori Lincoln, who is the person you should contact if you want to be part of this fun at volunteerfriendsofsoldiers(at)gmail(dot)com. Armed Forces Retirement Home-DC gardeners recently got together with Friends of the Soldiers Home volunteers for a spectacular picnic. 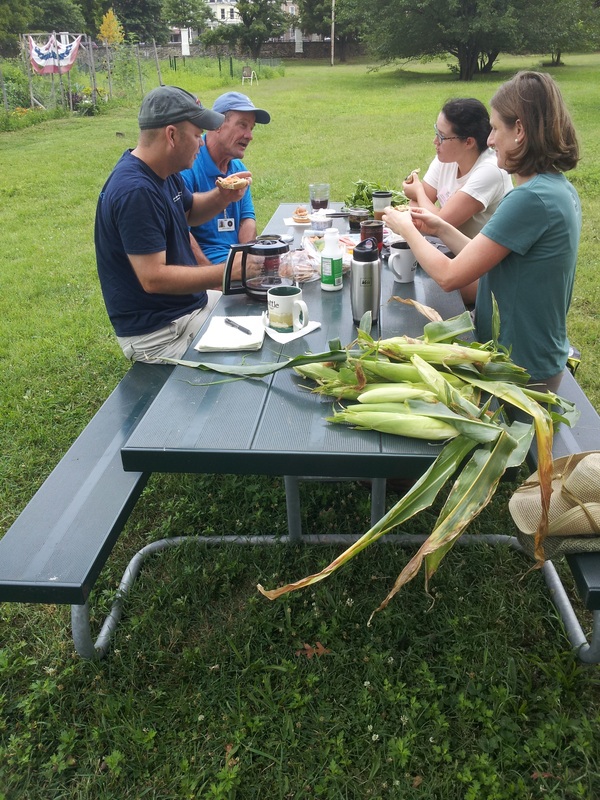 We had corn, cucumbers and ripened tomatoes grown through the Friends-AFRH garden project at the picnic tables. The event encouraged numerous new veteran faces to come down for the comfortable breeze and cold beverages. 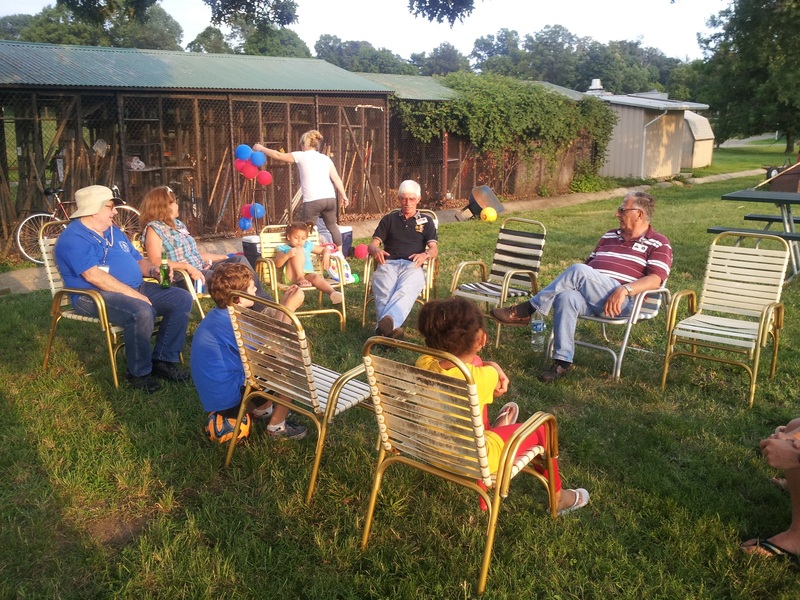 Gardening and non-gardening residents snatched spots with a neighborhood view under breezy trees in chairs and picnic tables. AFRH Garden Director Lori Thompson brought all the vital vittles and fire making to ensure a successful BBQ. Garden volunteers like Ellen Hughes helped with cooking, kindly purchased drinks and helped serve. The garden of AFRH resident Terry supplied all of the corn and then some. Terry has some popcorn on the way. Maybe we’ll have some homegrown, homemade popcorn at the next social! Story and photos by Ken Rubotzky. The Defender’s Inn on the Soldiers Home DC campus was a lively place Tuesday, Aug. 5 as veterans and Friends of the Soldiers Home got together for the monthly Saloon Night. The entertainment this time around was a trivia competition. Questions ranged from what is the Diamond State (Delaware) to what is the only medal with the words `of valour’ on it (Victora Cross) and who won the most Academy Awards (Walt Disney). In the end, team Mensa was tied with the Old somethings for the lead. That brought an overtime question on how many voting members are there in the U.S. House excluding delegates. The Old somethings were first to answer 435 and hence were the victors! Everyone wins, however, when the community and veterans get together. 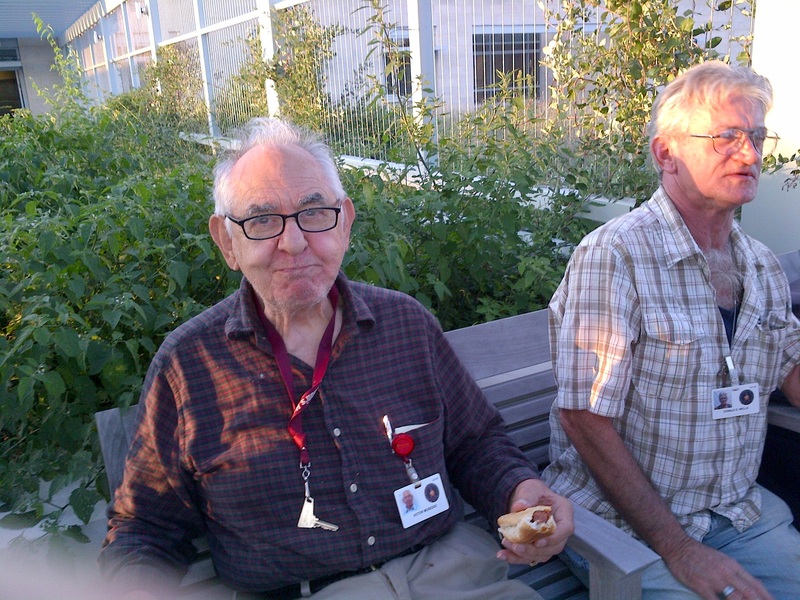 Tuesday, July 29th, was a lovely evening – and the rooftop of the Scott Building was a great place to spend it – as a dozen Friends volunteers gathered with veterans of our country and residents of the Armed Forces Retirement Home-Washington. The rooftop terrace provided lovely breezes and views of the city; residents provided wonderful stories of all aspects of their life and service, and Friends of the Soldiers Home served drinks, engaged in conversation and told their own stories. And what lovely weather! Who would have dreamed of a breezy, almost cool evening in Washington the last week of July?! Come and join us the last Tuesday night every month for Happy Hour at the Soldiers Home. If you are interested, write Lori Lincoln at volunteerfriendsofsoldiers (at) gmail.com.